On February 26th 1815, Napoleon Bonaparte slipped away from his island prison of Elba. He landed in France on March 1st with just 600 men. He marched on towards Paris, his old army flocking to his ranks. Even Marshall Ney, with 6000 men, went over to Napoleon. He was swept back into power, promising reform. The Allies quickly formed the Seventh Coalition, and declared war, not on France, but Napoleon. He was declared an outlaw. Napoleon quickly massed an army, as did the Allies. The Duke of Wellington was placed in command of an Anglo/Dutch/German army in Belgium, with Prussians under Blucher close by. The allied units were spread far and wide, meant to be a net to detect and ensnare Napoleon with overwhelming force. The key to this net was the crossroads at Quatre Bras; which Napoleon headed right for when he unexpectedly went on the offencive on June 15th. 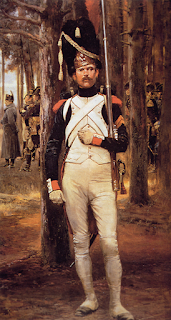 ﻿Napoleon sent his vanguard under Ney to smash the crossroads small, but growing garrison, while he was leading the main portion of his army to defeat the Prussians at Ligny. The Prussians were not destroyed and Blucher vowed to stay in Belgium to aid Wellington if he stood and fought. Eventually, late in the day on June 16th, the Allies had numerical superiority, and strategically retreated to a field Wellington had scouted in the last year as a great place to fight a defencive battle. This place was called Waterloo. The Allied army, having arrived first, got it's choice of the battlefield. Wellington selected a low sloped ridge, with a road on top. He also garrisoned the farm house of La Haye Sainte, the chateau of Hougoumont and the village of Plancenoit. The French arrived and took up position at the other side of the field, with Napoleon making the inn La Belle Alliance his HQ. Wellington recorded that "Around Ten-O'clock" Napoleon forces commenced "furious attacks upon Hougoumont". The chateau was valiantly defended by the Coldstream Guards, and the French were repulsed. At 11:50, Napoleon's Grande Batterie of 80 guns opened fire. 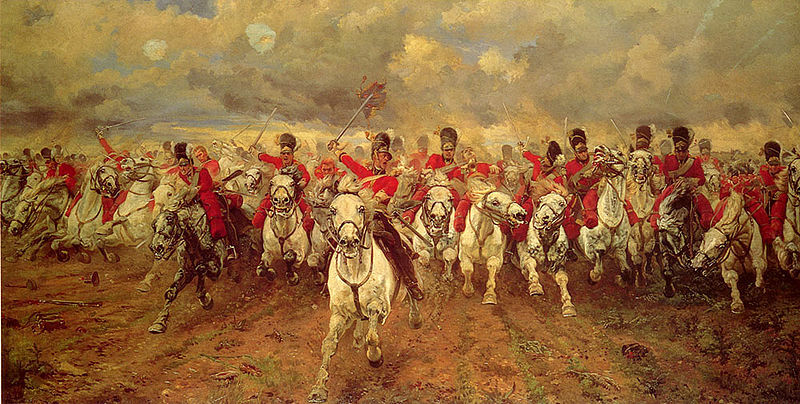 Their fire was largely ineffective, as Wellington's army was sheltered on the opposite side of the ridge. The French infantry then began to advance in column. The French, under D'Erlon quickly brushed aside some Dutch troops and prepared to manoeuvre into line as to outflank Wellington. Then, Thomas Picton's men stood up and blasted the approaching French. Picton forced D'Erlon's left to crumble, but was killed while doing so. The Allies began to be pushed back by superior numbers. Then, Wellington (or more accurately, Uxbridge) ordered his calvary into the fray. Wellington had frequently poked fun at his heavy calvary's intelligence in battle, but today they would do the best, and worst they had ever done on the battlefield. The heavies charged, and annihilated D'Erlon's corps, capturing two Regimental Eagles in the process. They charged well past the shattered infantry, eventually coming upon some abandoned French guns. Then the heavies saw French Lancers coming right for them. The heavies attempted to retreat but their horses were blown. Many of the heavies never made it back to the Allied lines, and they played no further part in the battle. The dead included Lord John Rossendale (if you get it tell me). 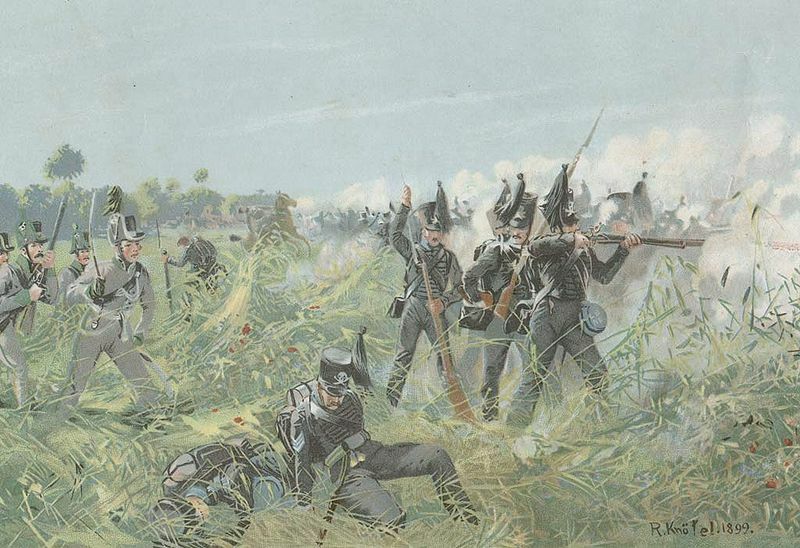 At this time, the Prussian IV Corps was seen approaching the field, and would soon engage the French right. They eventually attacked Placenoit, which had been occupied by the French. The French bombardment now recommenced while assaults were renewed on Hougoumont and La Haye Sainte. Wellington ordered the British to shelter on the opposite side of the ridge. Ney, who now had effective command of the French (Napoleon was being indecisive, due to tummy troubles) believed the British were retreating, so he sent in his calvary. 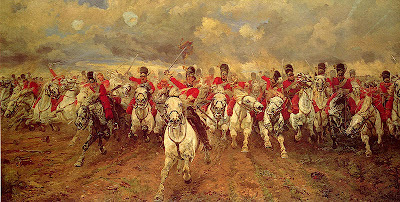 He meet with British infantry squares bristling with bayonets. The French charged as many as 12 times. Ney had five horses shot out from under him. Eventually the French blew their horses too, and they stopped charging. Being that the Prussians were now on scene, Napoleon knew he needed to smash the Anglo Dutch immediately and then turn his attention to the Prussians. So he sent in his finest troops, the Imperial Guard. 3000 Guards advanced in column. The Guard had never been defeated, and expected an easy victory. 1500 British Foot Guards were lying in front of the Guard. Wellington waited until the guard was within spitting distance until he uttered his most famous command "Now Maitland Now!". The Foot Guards (Did I mention they were under Maitland) stood up and devastated the Imperial Guard with horrific point blank volleys. The Guard now did something they had never done before, they edged backwards. The rumour soon spread through the entire French army. With even this small portion of the Guard shattered, their fighting spirit was gone. The Allies advanced, led by the light calvary (they were more professional). The French would be chased all the way to Paris. Napoleon surrendered on July 15th 1815. He was sent to St. Helena in the Atlantic, never to escape again. He died there in 1821.